The computer case that hauls your office in style. Foam padded computer compartment, (holds laptop up to 15.4" display). Locking-retractable, aluminum telescoping handle and in-line wheels for effortless use. 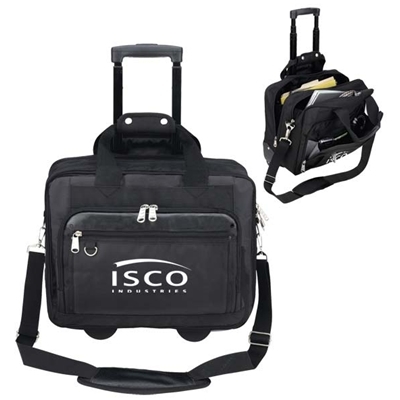 Multi-function organizer with cell phone and PDA pouches,magazine pocket, business card holders,mesh pocket and 'pen loops. Quick access to passport and travel documents in front pocket. Detachable accordion file divider gives room for a change of clothing. Zip-away handle design to carry it on the go. Zipper closure, comfort grip handle. Adjustable, detachable shoulder strap.